Iʻm working on a project that requires a long taper on a piece of wood thatʻs abut 64 inches long. This long taper is going to require a jig that I donʻt have so I made this one. I donʻt know if it is really going to work but theoretically it should work. On top of the base is what Iʻll call the taper/clamping board which is a piece of 3/4 inch plywood 4 inches wide and 72 inches long with short slots cut into it perpendicular to the slots on the base. 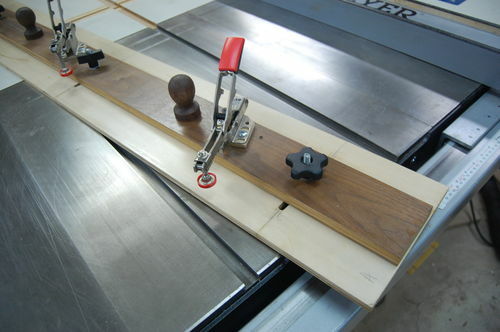 I then added knobs and the hold-down clamps to the taper/clamping board. 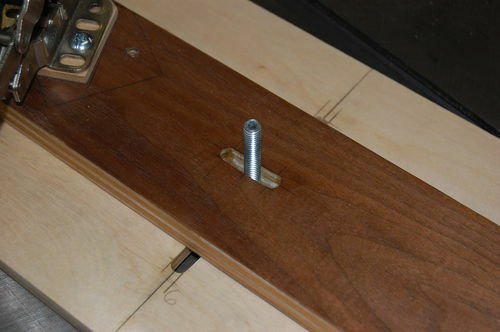 This is what the taper/clamping board looks like with the threaded knobs that clamps it to the base at the right angle and the hold-down clamps that hold the wood. 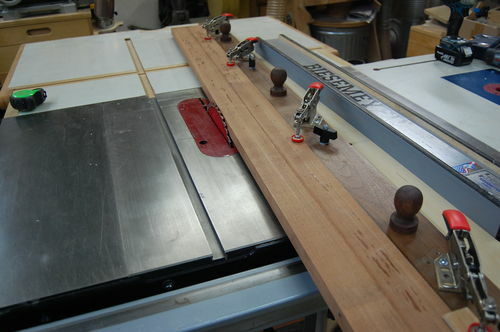 The base will ride along the table saw fence. This is what it looks like ready to cut a taper in a wide board. Here is another setup with a narrower board that also needs a taper cut. Iʻm sure Iʻm going to need a roller support to start the cut and the out feed table will help support the jig on finishing the cut. I sure hope it works. Iʻll edit this posting after I try it out. In building my Mahogany Coat Tree I discovered that the original 8” wide base worked for the narrow pieces that I had to taper but the wider piece required a wider base. I made another base that is 12-1/2 inches wide that worked better for the wider piece that I tapered. Thanks for taking the time to check this out. All comments and favorites welcomed. Necessity is the mother of invention. Nice job coming up with a tool to meet your need. That is a nice jig and will work very well, Alex. I have one very similar and use it a lot with many modifications for different angles. That type of jig keeps the part immobilized during the cut so just the bottom of the jig is sliding on the table and against the fence. 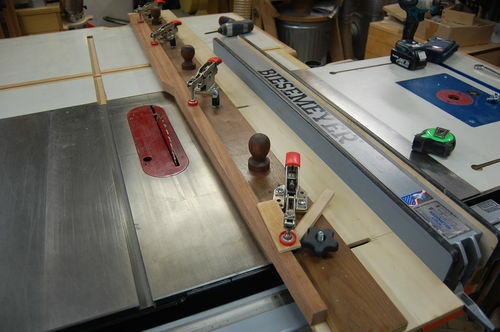 The only thing you might want to add is a stop or gage point at the end toward the operator so the width of the boards is consistent from board to board being that it is being cut on a taper. Great looking and nicely designed jig. I agree with Jim that will work very well and suggest you consider adding a stop at the operator end for consistent cut for each board. Jim and Hillbilly—I think thatʻs a great suggestion. I think Iʻm going to have to redesign it for more flexibility and add a variable stop at both ends. I think my base is going to have to be wider. Good suggestions. Thanks. Have you thought about how you’re going to store this great jig? I have a storage box I built a couple of months ago for some track saw rails that I’ve thought about posting since it is horizontal given the vertical limitations of my basement. If you do make any changes, please post so we can see. Hillbilly—itʻs funny you mentioned storage. I have already made a place to store it. Itʻs hanging from the joists over head in the shop. If you looked up in my shop you would have a good laugh. 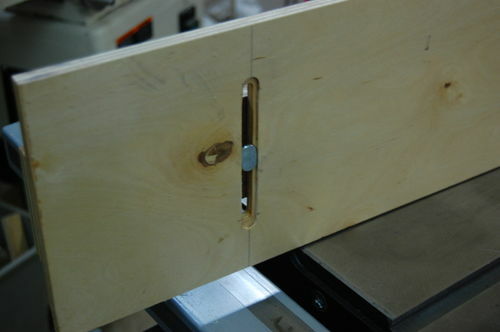 I also made places to store the multi-use table saw jig pieces too. Looks like a great jig to me. It will work. 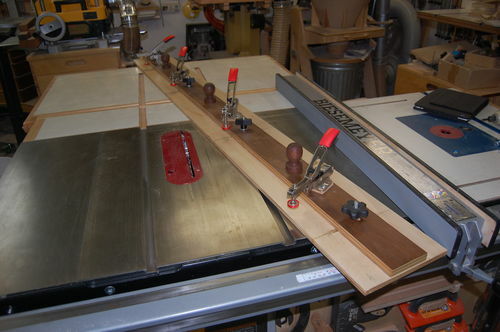 I made a similar jig a while back when I needed to cut 30” tapers for a project. The only difference is I put a 3/4” wide hardwood strip that runs down the miter slot in my saw. I can see how that would be more difficult on yours because of the length. Oh yes. For those long long tapers. This is a great looking jig, well thought out. Well, that’s the longest taper jig I’ve ever seen! Nice! Alex, That will do the job for sure, but I have to wonder what you are making with such long tapered components. Cool Jig Alex – I’ve been meaning to build one of these for a while, but haven’t had a project design that requires one just yet. I’ll keep this jewel in my back pocket as it is one of the better ones I have seen.